Stashbuster Baby Granny, originally uploaded by earthchick. 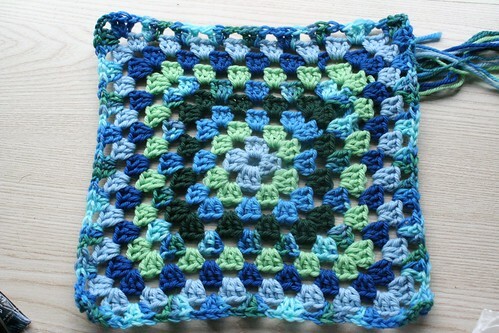 I’ve always wanted to crochet a big granny blanket, and now that I have, I just want to keep making more. What fun! I made this to go with the striped baby sweater I showed you yesterday. I went stash-diving and came up with 6 different shades of Swish Worsted (three blues and three greens), plus a wee bit of Lorna’s Laces Shepherd Worsted in “Icehouse.” And I got hooking. It was so gratifying how fast those first rounds went!! I would do a round here and there, and it just kept growing and growing. When it got to this point, I thought it was almost done and that a few more rounds would put me at 36″ square. 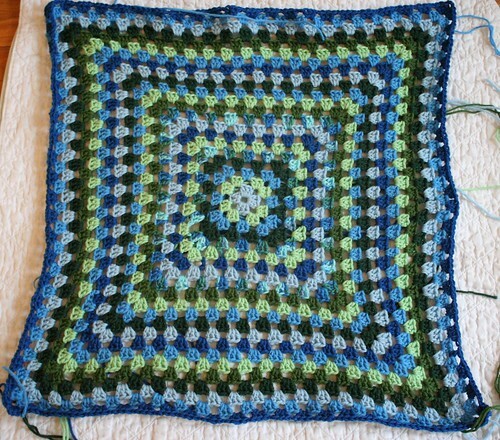 But the reality was, once I added those few more rounds plus the border (5 rounds of single crochet), and blocked it, it came out to nearly 50″ square. 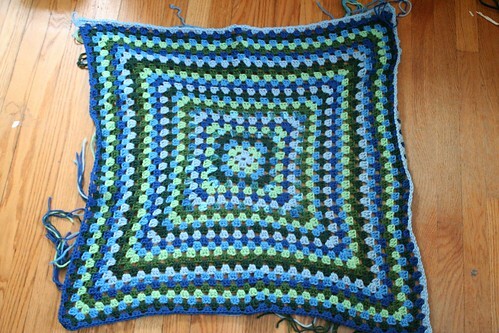 I think it will make a great blanket for many years, from babyhood, to toddlerhood, and on. – the light green was repeated in ever-widening increments – the first repeat of it was 4 rounds after the first use of it, then the next repeat was 5 rounds later, then the next was 6 rounds, etc. It was a lot of fun to improvise within these two constraints and see what happened. 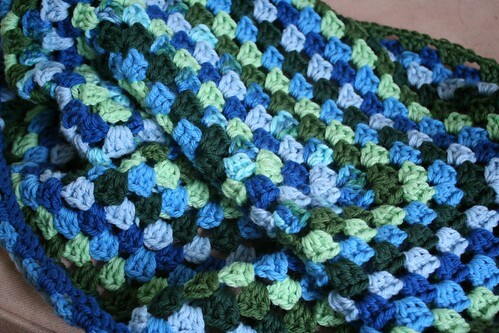 I’m especially happy with how the dark blue and olive green stand out in the blanket. I would say that a granny blanket and a child’s placket-neck sweater make a pretty nice combo for a baby gift. And I’m pleased with the Swish Worsted, which is machine washable. 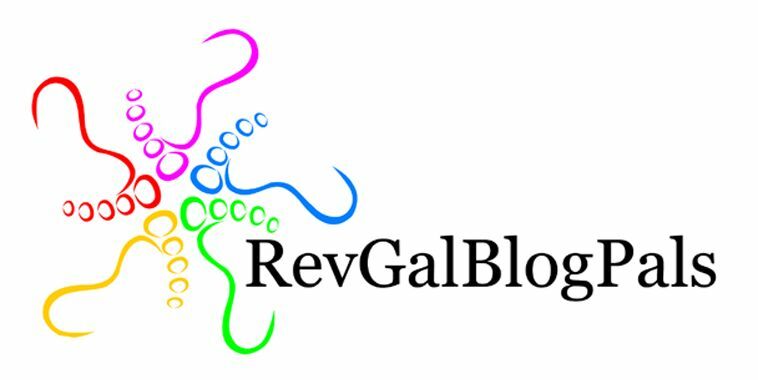 Fabulous crafting! I love those colors. I have a blue-eyed babe and am quite coveting that sweater! What a great set! I love those colors — so cute.